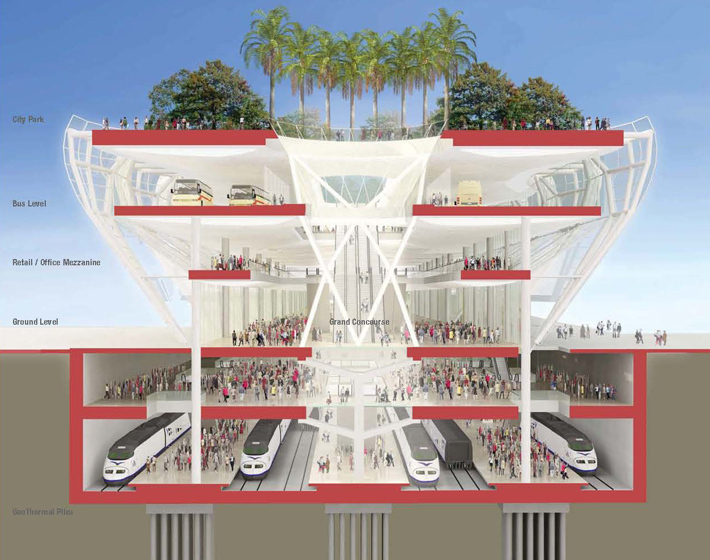 The Salesforce Transit Center, a bus and high speed rail station, is capped at the roof with an iconic 5.4 acre park, designed as both a public destination and community park within downtown San Francisco. The park serves as an essential element in the growth of the new neighborhood and provide high-quality open space in an area that lacks significant land for park development. The park has been conceived of as a multifunctional space providing respite, activity, and education for transit users and local residents alike. It is integrally designed with the building in order to achieve expansive areas of soil to support large, healthy trees and shrubs, and to seamlessly tie into the architectural sustainability programs. The park design is composed of curving paths that lead visitors through different experiential settings, both contemplative and social. In order to create a topography that blurs the distinction between roof and ground, the park will integrate mounded vegetated hills with domed architectural skylights that allow daylight into the terminal below. 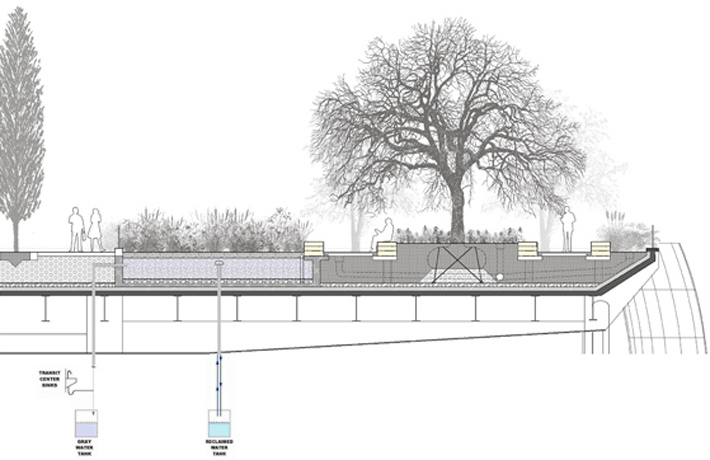 PWP is working closely with environmental artist Ned Kahn on a 1,200-foot-long Bus Jet Fountain—a feature in which buses moving through the terminal trigger jets of water in the park above. The park will actively improve the environment by absorbing carbon dioxide from bus exhaust, treat and recycle water, and create a locus in downtown San Francisco for birds, butterflies, and other pollinators. 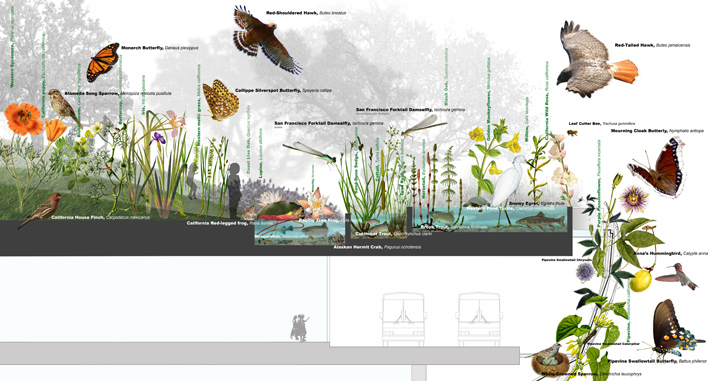 Storm-water runoff from the roof-top park, as well as water from the sinks in the terminal building, will be collected and polished in a subsurface constructed wetland at the east end of the park. The water will then be used in the restrooms throughout the terminal. At the ground level, PWP is working with multiple agencies to develop a streetscape and urban design for the four-block-long core of the Transbay District, including Mission Square where a monumental sculpture by Tim Hawkinson will stand.